England have an excellent recent record in their final matches before major tournaments and our England v Costa Rica betting tips expect that to continue at Wembley. Q: When was the last time England failed to win their last international friendly before a World Cup or European Championship finals? A: Against Cameroon in 2002, when a last minute Robbie Fowler equaliser saved Sven-Goran Eriksson’s men from a dispiriting defeat against the Indomitable Lions on the eve of the World Cup in Japan and South Korea. 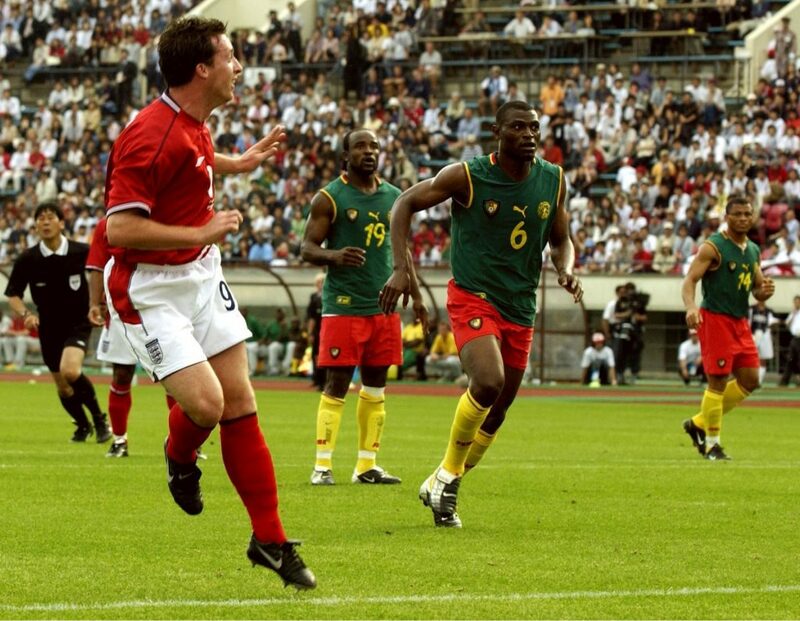 Robbie Fowler equalises against Cameroon in Kobe, in 2002, the last time England failed to win their last international friendly before a major tournament. Since then, they’ve won six successive send-offs scoring 18 times and conceding only twice. The hosts are just 4/11 to beat Costa Rica in their pre-World Cup-2018 farewell fixture, with Los Ticos 8/1 outsiders for victory and the draw a 19/5 chance. A Three Lions win to nil at 10/11 looks a more appealing betting proposition in consideration of both their historical habit for comfortable wins in their last pre-tournament prep outings and recent defensive stinginess from Gareth Southgate’s side. Four of England’s last seven matches have seen them keep a clean sheet, while it’s nine outings since they conceded more than a single strike. Costa Rica went to town on Northern Ireland last time out, winning 3-0, but prior to that they’d notched once in five games, getting shut out by middling foes including the USA, Hungary and Tunisia. In terms of who will do the damage for the England against Costa Rica, why bother trying to guess which member of the supporting cast will chip in, when you there’s Harry Kane any time goalscorer odds of 8/11 or first goalscorer odds of 9/4 to get stuck in to? The Tottenham hero and Three Lions captain has struck score at least once in his four of his five internationals this season, scoring the first goal on three of those occasions. Given England have mustered a single goal at most in four of their last five outings, betting on him to score first in the last England friendly before the 2018 World Cup looks worth the slightly greater risk.